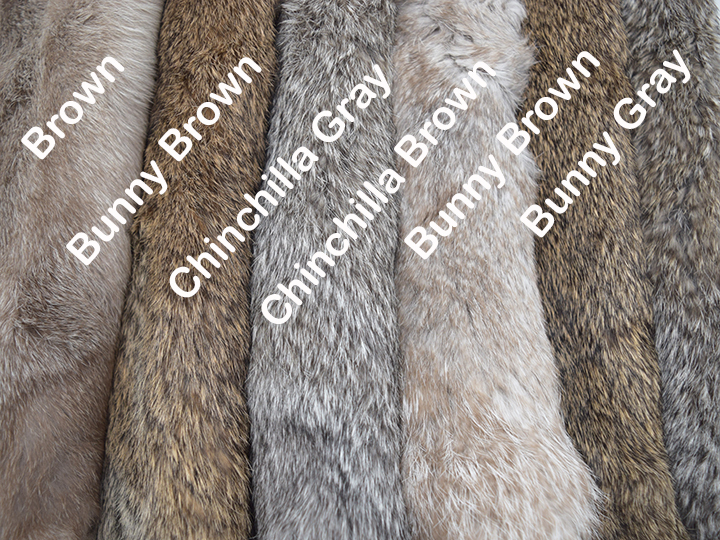 See the range of colors of the natural-colored rabbit skins. According to U.S. Department of Commerce statistics, we are one of the largest importer of tanned rabbit skins in the United States. We import between 100,000 and 200,000 rabbit skins per year and have been in this business for more than a decade. We understand this market thoroughly and know that our skins are some of the nicest ones for the price in the market today. This web page is extensive. It is broken into sections to try to answer many questions our customers have about the various grades of skins. Please do not hesitate to call us at 1.800.206.6544 if you have any questions. Thank you. Please click HERE to see a gallery of Chichester's Best Czech female grade rabbits. How Much Does It Cost For Shipping Within the USA? Where Do the Rabbit Skins Come From? Do We Buy Rabbit Skins? Why Are There So Few Natural Colored Rabbits? Why Do Rabbit Skins Often Have Yellow Edges? What are the Rabbit Skins Used For? "White" vs. "Natural" vs. "Dyed" vs. "Bleached"
We use the following definitions for our rabbit skins. When ordering, please ensure that you use our terminology to get the skins that you want. White Rabbit Skins refer to rabbits that are virtually all white in color and have not been dyed or bleached. They could be referred to as Natural White because they have not been altered by dye or bleach, but we simply refer to them as White rabbit skins. If you order White skins or Natural White skins, you will get all-white skins that have not been dyed or bleached. Click HERE to see a picture of our White Rabbit skins. Natural Mixed Color Rabbit Skins are a cross section of the colors other than all white that are found amongst domesticated rabbits, such as bunny rabbit brown, natural black, spotted, fawn, chinchilla, etc. These have not been bleached or dyed. Dyed Rabbit Skins are skins that have been commercially dyed to a variety of different colors, such as orange, blue, red, pink, black, yellow, etc. We offer 25 different colors, including fluorescent colors. 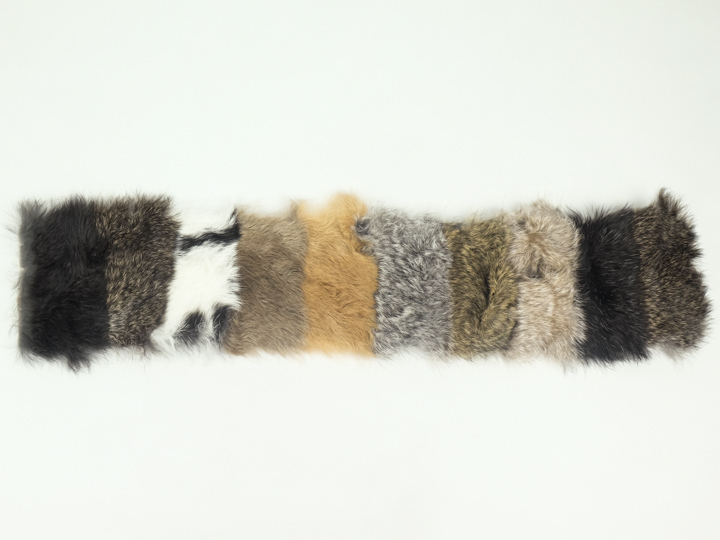 Click HERE to see a sampling of dyed rabbit skins using our Better Grade Size Dyed Rabbits. Bleached White Garment Grade Rabbit Skins are white skins that have been treated with bleach to brighten the skin, that is to make it whiter. Click HERE to see a picture of our Garment Grade Bleached White Rabbit Skins. Click HERE for a comparison of bleached white and regular white skins. Black Dyed Rabbit Skins are skins that have been dyed jet black using commercial dyes. Natural black rabbit skins are skins that have NOT been dyed and tend to be more of a natural, charcoal gray. The Stencilled Rabbit Skins come in various animal patterns. Click HERE for pictures and prices of the stencilled rabbits. Please do not hesitate to ask us if you have any other questions about the skins. Please note that we have a US$75.00 minimum order. You can mix and match merchandise from elsewhere on the website, but the total before freight must be at least US$75.00. Sorry, but we do not waive this minimum amount. We do not waive the quantity pricing structure. If you order 32 rabbits, we will not give you the 100 price. If you order 100 rabbits, we will give you the 100 price. To the best of our knowledge, nearly all other importers in the United States rely on overseas tanneries to grade their skins. These firms then take the bundles of 100 skins out of the bales of 1,000 skins and ship them off to their customers. With the better grade skins, this is often possible--although we still inspect bundles at random to ensure that they meet the grade. We have found, however, that for the lower grade skins, we have to sort these again when they arrive at our warehouse in Niagara Falls, New York. When you buy skins from us, you will get consistent grading. The following grading guidelines should help you choose the rabbit skins that will work best for your application. If you have any questions, please do not hesitate to call us at 1.800.206.6544 for clarification. The Scrappy Grade Rabbit Skins are very low quality skins. They are sorted into white and mixed natural colors. We do not do any other sorting. They are half or partial skins from very small rabbits. They tend to have rips and tears, holes, bald spots, and are not polished on the back. The hair quality is lousy, either flat or semi-matted. They look ratty. They are perfect for crafts where only a small piece of fur is required. If you want something nice, don’t buy “junk.” Maybe they will work for you, maybe not. If you return these, return the entire lot if you want to buy rabbits from us again. We do not allow any upgrading or picking. See price list above. The Poubelle Grade Rabbit Skins may be low quality skins. They are sorted into white and mixed natural colors. We do not do any other sorting. They are small skins or torn skins. The hair quality is lousy, either flat or semi-matted. They look ratty. We sell every skin we get and have trouble keeping supplies in stock. They are perfect for trading posts or uses where only a piece of fur is required. If you want something nice, don’t buy “junk.” Maybe they will work for you, maybe not. If you return these, return the entire lot if you want to buy rabbits from us again. We do not allow any upgrading or picking. We have had very few returns for this item. A few customers will not re-order the cheap skins, but most happily join a wait list. See price list above. The Grade 5 Rabbit Skins are a mixture of grades. Each lot will include different combinations of reject, clipper, cut-up, trading post, craft, and gift shop grade skins. Do not buy this grade if you want a specific quality of skin as this is a mix of grades. These skins are best sellers. See price list above. The Clipper Grade Rabbit Skins are generally decent chrome-tanned rabbit skins that have extensive yellowing. These skins are ideal for testing dog and human hair clippers. The hair is fine (it is not matted), we just don't like the color and presentation. They could also be used to line the inside of gloves and mukluks. We have many customers in the clipper sharpening business and know their requirements for suitable skins to test the clippers. See price list above. The Cut-Up Grade Rabbit Skins are lower quality skins that have good fur, but have serious cosmetic defects. For example, these skins can be smaller than normal, misshapen, have extensive tears, holes or bald spots in the middle of the skin or have patches of bad hair on them. They are unsuitable for resale as novelty skins to tourists or kids, but are ideal for cutting up into smaller pieces for craft projects or for testing clippers. We use this grade of skin to make many of our rabbit fur bags and for trim on crafts. These are good value for the money if you need good fur and can work around the problems. See price list above. Click HERE for pictures of some Cut up Grade rabbit skins. The Trading Post Grade Rabbit Skins are generally full skins with areas of weak hair coverage or minor defects. They are suitable for people who want a rabbit skin for whatever purpose and do not know or care about the quality of the hair. They are also suitable for craft projects, especially for ones using small pieces of rabbit. The white skins are chrome-tanned and may have a bluish cast to them or more yellowing than skins from our primary tannery. This is the grade most commonly found in the marketplace. This is also a grade that many Boy Scout troops or camps buy. See price list above. Please click HERE to go to a page with 50 pictures of this grade to give you a better idea of what to expect. The Craft Grade Rabbit Skins are lower quality skins that can be misshapen, smaller than normal, or have some other minor defects, such as tears, lower quality fur, or minor bald spots or holes on the side. These are Spanish "pulgares" skins, often called "thumbs" in English because they are used to line gloves. We do not control for size in this grade. Some of the skins will be larger than average and some smaller. Nonetheless, these are generally full skins, not pieces. We double tumble our skins in Spain to offer the best quality possible. See price list above. Click HERE for a picture of some Craft Grade rabbit skins. The Gift Shop Grade Rabbit Skins are slightly better than the craft grade skins, but do not have the consistent fur quality of the better grade skins. While we can tell the difference between grades, most people have trouble telling the difference between the gift shop grade and better grade skins. These skins are primarily sold to gift shops for resale to kids. They are ideal for Boy Scout camps that want to offer rabbit skins to the scouts. Our main grading guideline is that they look like a full rabbit skin and do not have serious cosmetic defects. See price list above. The Better Grade Rabbit Skins are full size skins suitable for sale in galleries and more discriminating gift shops and trading posts or for use in craft projects and manufacturing activities that require very nice fur quality. These skins have a more consistent hair length (~3/4" - 1") and few, if any, imperfections. These are Spanish "forro" skins, often called "lining" in English because they are used to line jackets and garments. These skins are pretty similar in color to the Spanish Garment Grade. The main difference is the plushness of the hair and consistency of hair length. The garment grade are a bit denser than the better grade. See price list above. Click HERE to see pictures of the better grade skins. The Spanish Garment Grade Rabbit Skins are the best quality rabbit skins produced in Spain. These skins are Spanish "peleteri" used by the fashion industry. Nearly all of the skins are used by the Spanish firms to produce rabbit skins plates (2' by 4' pieces of material) that are then further processed into many designs. We only maintain limited stocks of this grade at this time. Click HERE for pictures of the bleached skins. See price list above. The Spanish Female (Breeder) Grade Rabbit Skins are 50% to 100% bigger than regular rabbits from Spain and the hair tends to be heavier than that of the typical Spanish rabbit, but not as heavy as on rabbits from Hungary or the Czech Republic. The breeder rabbits are good value for the money and are nicely tanned. The #1/2 rabbits are good quality skins with few, if any, imperfections. The #3 skins have minor problems (holes, rips, tears, or bald spots) and are ideal for craft projects. See price list above. Please click HERE to see pictures of the Czech and Spanish Female Grade. The Czech Female Grade Rabbit Skins are 50% to 200% bigger than the regular rabbits from Spain. They are the nicest rabbits we have ever seen. They are soft-tanned, big, and very heavily furred. The hair is 1" to 1.25" long. They are ideal for resale or for craft projects requiring excellent material. They are suitable for trim on parkas, mukluks, and gauntlets. The #1/2 grade are soft, supple, and may have some minor imperfections such as a slip or hole somewhere. The #2/3 grade are similar to the #1/2 grade but with more imperfections, such as holes, tears, or hair slips (bald spot) somewhere on the skin. They are perfect for cutting up. The #3 grade are similar to the #2/3 grade but may be not as big or not a full skin. They may also have messier hair (hair that does not lay flat). There may also be some matting and yellowing. The #4 grade consists of various grades. Each lot will include different combinations of reject, cut-up, and tranding post grade skins. Do not buy this grade if you want a specific quaility of skin as this is a mix of grades. The Czech Female (Craft) Grade Rabbit Skins are tanned in Spain. The quality of the tanning is not as good as the ones tanned in the Czech Republic, but the skins are soft tanned and heavy. The Gift Shop grade and Craft grade skins are 50% to 100% bigger than regular rabbits. The Gift Shop grade skins may have slight imperfections. The Craft grade skins have more cosmetic flaws, but are still good value. The Cut Up grade skins have holes, tears, rips, or bald spots, and may be misshapen or smaller. They are perfect for cutting up into smaller pieces for crafts that require heavy rabbit fur. The white skins may have stains. The Heavy Low Grade rabbits are large Czech breeder rabbits with heavy fur that are tanned in Spain. The Grade A skins are generally whole skins without major imperfections. The Grade B skins are craft quality. The Grade C skins are yellowed or have extensive problems. See price list above. Please click HERE to see pictures of the Heavy Low Grade rabbits. The Moroccan Heavy Rabbit Skins are among the heaviest, plushiest rabbits we have ever seen. These skins are soft-tanned, big, and heavily furred. They are available in three grades. The white skins contain traces of creaminess Very suitable for trim and craft projects that require excellent fur. See price list above. 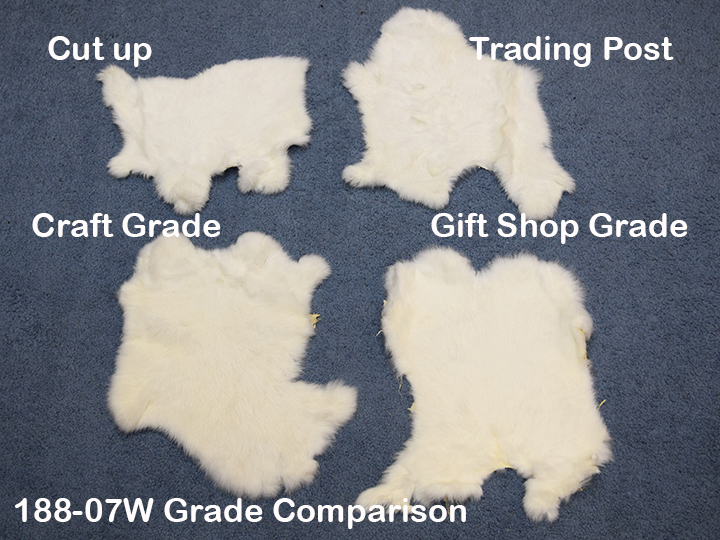 This video shows a comparison of five different grades of white rabbit skins: poubelle, trading post, craft, gift shop, and better. 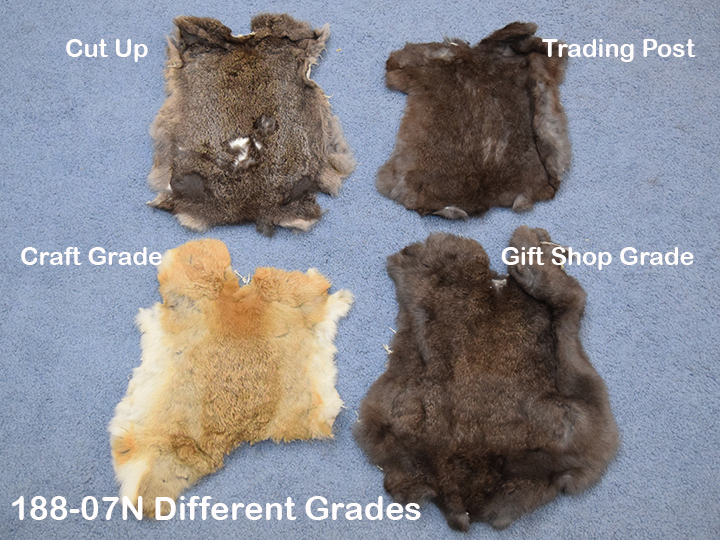 This video shows a comparison of five different grades of natural rabbit skins: poubelle, trading post, craft, gift shop, and better. We have used the better grade rabbit skins as our benchmark for the size of a "typical" rabbit skin. We measured three individual skins at random to get an approximate size for this grade. Because the skins are not a true rectangle, we provide two measurements for each skin: the maximum dimensions and the minimum usable dimensions. The first skin was 11" by 17" for the maximum dimensions and 9" by 14" for the minimum. The second was 13" by 16" maximum and 9" by 12" minimum. The third was 12" by 18" maximum and 11" by 12" minimum. The sizes may vary somewhat, but this will give you a good idea of what to expect. The cut up skins can range from half-skins to larger than the better grade ones. We do not control for size on this grade. You will get at least half a skin--usually far more. These are not scrap or tiny pieces. The craft and gift shop grade skins are generally smaller or about the same size as the better grade skins described above. The main determinate of this grade is fur quality, not size. Consequently, some skins can often be rather large compared to the "typical" rabbit skin. The garment grade skins are the same size as the better grade skins described above. We measured a few black Spanish rabbit skins and they were 14.5” x 12", 14" x 11", and 15" x 11.5". They are about 1/8" thick. The large Spanish female rabbit skins are approximately 17” long by 13” wide overall. The large Czech female rabbit skins are generally about the same as the better grade or "typical" rabbit skins described above, but have heavier fur. We measured several Creamy White Czech Female rabbits and found that they are 15" to 19" (average 18") long and 11.5" to 15" (average 13") wide. The average size of the rectangle that you can get from the rabbit skin is 11" by 15". The width is either 10" or 11" and length can be from 13" to 15". Please click HERE for a gallery of Natural Colored Rabbit Skins available today. The size of the bundle of regular rabbit skins is approximately 12" wide by 17" long and 8" high. The approximate weight on a bundle of 100 regular size rabbit skins two months after tanning is 11 to 12 pounds. (4.98 kg to 5.44 kg) The female skins will weigh considerably more. One rabbit skin weighs approximately 2.1 ounces (58.59 gm). Please note that the rabbits may have a mothball odor because we have to prevent bugs from getting into the skins. We would rather have a mothball order than moths. You can reduce this odor by either airing them out or by tumbling the skins in a dryer with a dryer sheet on very low heat for no more than five minutes. Any more than this will shrink the rabbit skins and you will no longer have the option to return them if unsatisfied. If you're worried that the rabbits skins may leave an odor in your dryer, we suggest you use a public laundromat. We have been importing rabbit skins for ten years. We receive monthly shipments from Spain and usually import between 150,000 and 200,000 rabbit skins per year, making us one of the largest importers of tanned rabbit skins in the United States. We sell to distributors, craft supply companies, gift shops, trading posts, clipper sharpening firms, manufacturers, artists, and crafts people. We have dealt with a number of tanneries in Spain, Brazil, Hungary, Switzerland, the Czech Republic, and China and now work closely with a tannery in Spain that is more concerned with quality than simply volume. The rabbit skins from this tannery are washed three times instead of two as is common at most tanneries and are alum tanned instead of using the more conventional chrome tanning process. This special preparation makes the skins softer and more supple to work with. The regular Spanish rabbit skins (not the females) tend to have thinner skin than some skins from Brazil or eastern Europe. The thinner skins makes it easier to work with the skins in garments. We are also interested in growing our business and know that if we ship you what you expect, you will re-order from us. We know what is in the market and are appalled at what some people charge for low quality skins. Compare our skins to those of others. We think you will be surprised. Emiliano from Switzerland writes upon receipt of the better grade rabbit skins he ordered: I've just received the skins. They are faboulous!!! Thank u a lot!!!!! I will send u a pictures when the blanket will be finished!!! Best regards and thank u again. Francesco from Italy writes regarding the 110 clipper grade rabbits he bought: the fur is perfect. it's better than i think. It's a pleasure buy from you, all my regards. For the smallest order (US$75.00), please allow at least US$8.00 for shipping by UPS anywhere in the lower 48 states. Depending upon your location, it takes 1-5 business days (not including weekends and holidays) for UPS to deliver the shipment by regular ground service. The closer you are to Niagara Falls, New York, the shorter the time. No COD orders under US$150.00 due to the high cost of processing the COD shipment. COD money order only. The cost to send 200 Gift Shop Grade Rabbits to a residence in Wisconsin by UPS was US$18.50. The cost to send 100 Better Medium Rabbits to a residence in California by UPS was US$21.90. The cost to send 100 Better Medium Rabbits to a residence in Indiana by UPS was US$11.74. For larger orders, allow anywhere from about US$0.03 per skin to US$0.08 per skin depending upon distance from Niagara Falls. We use Global Express Mail Service to send small quantities of rabbit skins internationally, which takes 3 - 5 days and includes a tracking code. A typical bundle of 100 rabbit skins will weigh around 11-12 pounds for regular rabbits and 14-16 pounds for the better grade bigger ones. Add a pound or two for the weight of the box. The cost varies slightly from one destination to the next. You can see the U.S. Postal Service's website at www.usps.com for postage amounts. Go to the website and click on their postage calculator in the red header bar on the home page. Then click on Calculate International Postage and then select package. You will have to specify your country on another screen and then the estimated weight. We charge US$2.00 per box extra for shipments that we take to the post office, so include this in your estimate. There are also minor charges for insurance and delivery confirmation. A recent shipment to the United Kingdom cost US$68.75 via Global EMS. It will be shipped in two boxes each containing 100 rabbits sized 20” x 13” x 13” and weighing approximately 17 pounds. Express Mail International (3 to 5 business days not including custom delays if any) is US$155.60 for each box. Priority Mail International (6 to 10 business days not including custom delays if any) is US$125.00 for each box. Please allow some delay for customs clearance. The domesticated rabbit skins can be exported without obtaining an export permit from the U.S. Fish and Wildlife Service. Transit times by air mail are usually 4-10 business days by regular air mail, but there is no tracking number and no guarantee delivery time. If the shipment is sent by surface (sea), the transit time jumps to 4-6 weeks. The base rate to Australia for 100 premium rabbit skins was US$71.60 for air mail (4-10 days) and US$34.60 for surface mail (4-6 weeks). We are very careful in counting rabbit skins when preparing bundles. In the past, we have had the occasional customer who claimed a shortage on a shipment. Often what happens is that customers try counting the skins by flicking through the end of the bundle. This does not work! The only way to count a bundle of skins accurately is to untie the bundle and flip one skin at a time into another pile. Often the skins stick together, so you have to be careful to ensure that each skin is carefully counted. Once you get to 50 skins, you need to make another pile. It is very hard to keep a pile much larger than this from falling over. In many parts of Europe and Latin America, the people there eat rabbits the way we eat chickens in North America. The skins are a by-product of the food-processing industry. The rabbits are raised for meat, not for their skins. Yes, we buy "tanned" rabbit skins, but not "raw" ones. There is very little market for raw rabbit skins in North America unless you can produce at least 80,000 skins every few months. There is some demand for raw (i.e., untanned) "rex" rabbits in North America, but we have not been tanning these. If you are interested in having your rex rabbit skins tanned, let us know; we can recommend a tannery that will process these for you. If the quality is good, we may be interested in buying the tanned skins. The white rabbits grow faster and larger than the mixed-color ones and are consequently favored by farmers who raise them for meat. Over time, the number of mixed natural color rabbit skins available for tanning has fallen considerably. Today, nine out of 10 rabbits processed for food are white. This means that only one rabbit in 10 is a mixed-natural color rabbit. Given that people raise the rabbits for food, the percentage of white rabbits is likely to continue to increase over time. The white rabbit skins in particular often turn yellow on the edges over time. It is common for many people to believe that these are urine stains from when the rabbits were in the cage. The real problem is that fat on the skins runs when the skins get warm or are stored too long. If the skins are fresh, they are usually snowy white--even in summer. It is only after they have been sitting in a hot warehouse for months, if not years, that the skins yellow. All of the rabbits that we get from our preferred tannery in Spain are fresh goods. They have usually been tanned only weeks before they are sent to us on our monthly shipment. In general, our rabbit skins will be some of the whitest ones available. When I first started importing rabbit skins, I was astonished at the wide variety of uses for the skins. Here is a list of things that I am aware of that the skins are used for: skins for kids to play with (go figure), doilies, jewelry displays, trim on Native American crafts (kachinas, peace pipes, mandellas, etc. ), painted on the back, cut up into small pieces for fly fishing, trim plaster masks, test human and animal clippers to ensure that they are sharp enough to cut hair, cut the hair off for dubbing in the fly fishing industry, make into bags, line gloves, trim collars and cuffs on garments, fur coats for dolls, Halloween costumes, cat toys, etc., etc. If you have other uses, please let us know. Some people put many rabbit skins together to make a throw or blanket. (Click HERE to see a sample blanket that was made using our dyed rabbit skins.) While it is much easier with a fur machine, it is possible to sew rabbit skins together using regular thread and a sewing machine that has a walking foot. We recommend gift shop or higher quality skins to make blankets. The hide side on the gift shop grade and better grade skins are the same. The main difference is the CONSISTENCY of the HAIR LENGTH. The better grade skins tend to have hair that is more consistently the same length. Many people do not even notice the difference, but it is there. If you want to use the rabbit skins to make dog toys, cat toys, or pet toys, we have sold thousands of rabbit skins and have never had a complaint from manufacturers or dog owners. However, for liability reasons, we do not confirm the suitability of our rabbit skins for any specific application. The weights vary depending upon the size of the skins and how recently they have arrived from the tannery. Super fresh skins have more moisture in them and tend to weigh a bit more than ones that have had sufficient time to dry thoroughly. For gift shop grade skins, assume a working weight of 12 lbs (5.44 kg) per 100 skins. Keep in mind that you will need to add two to three pounds (0.9 to 1.4 kilograms) extra for the weight of a box when calculating shipping amounts. The 1/2 Czech white rabbits weigh 28 to 32 pounds per 100. One bundle we weighed came in at 30.72 pounds. Expect a bit more or less depending upon the individual skins in the bundle. We have documented as much as possible about our skins to help you select the right grade for your use. We are also willing to recommend grades and discuss the merits of one grade over another. If we send something you do not like, please call us promptly after receipt and then return all of the skins within 30 days. We do not allow high-grading of the skins--that is just taking the ones you want and sending the rest back. We will issue a full refund for the skins--but you pay shipping and insurance both ways. We have very few returns and many delighted customers. We do not distinguish between retail and wholesale prices with the rabbit skins. All pricing is based on the number of skins you buy. Most retail customers only buy a few skins at a time and do not get the price breaks. Wholesale customers tend to buy 100 or more skins at a time and get the lower prices based on volume. We enforce the price breaks in fairness to our wholesale customers. If you can buy 1,000 or more rabbit skins at a time, can pre-pay, and are able to plan ahead, you may want to inquire about joining our import program. We work with a number of distributors and manufacturers across the United States who purchase in large quantities from us. Your shipments can ride along with ours, thereby saving everyone money. At this time, the supply of natural color skins is limited so we can only take on new customers for the better quality white rabbit skins or black dyed rabbit skins. If you want to learn more, please call us at 1.800.206.6544. To ensure quality control, Chichester is one of the few companies that re-grades all skins when they arrive in the United States and classifies them according to our consistent grades. Thank you for considering us as your rabbit skin supplier. I hope that we will be able to serve you.